Finally, the long heralded debt deal has arrived, and with no small fanfare. As the Dail Debate ended, Enda Kenny declared “[t]he Anglo promissory-note payments are gone“, which made for catchy, if misleading, headlines. The deal, as you’ll have read, postpones payment of IBRC debt for up to 30 years. While Anglo’s debts aren’t quite gone (we still being forced to pay them), they have been pushed far enough in to the future so as to make them look much more…manageable. Discussing the highly concentrated ownership of Irish media on the eve of Gavin O’Reilly’s departure from Independent News & Media, Vincent Browne makes a statement his former editor Geraldine Kennedy would be proud of. Yet gone are the days when the Irish Times could credibly boast to be ‘leaders’ or ‘shapers’ of public opinion, save for a small subset of influential south Dubliners. Successive campaign failures over the last few years, including the Lisbon Treaty and more recently the household charge, have shown the limitations of the media’s agency to sway public perspective. On the other hand, the media’s ability to influence or at least reinforce government thinking on certain important policy issues has not been undermined. Successful campaign wishes for austerity budgets since 2008 have been granted, with politicians responding to the media “call to arms” by throwing caution to the wind, “sticking to their guns” and delivering the required “tough medicine” over and over. Although this glass-half-full enthusiasm can’t completely disguise the campaign’s “abject failure“. It’s fair to say the public were decidedly un-shaped. One of the most interesting features of mainstream reporting on Israel and Palestine is the disparity between the way violent attacks by each side are presented. Israel’s actions are chiefly explained in terms of its right to “self defence“, while those carried out by Palestinians are more often than not portrayed as attempts to undermine Israel’s “security“. Palestinian attacks on Israeli targets are depicted as random acts of violence, with no mitigating or explanatory considerations whereas Israeli attacks are predominantly reported as responses to a Palestinian threat. For instance, a recent Irish Times report on the killing of four apparently unarmed Palestinians by the Israeli Defence Forces (IDF) offered the following by way of explanation: “Palestinian militants in Gaza frequently try to attack Israeli border patrols and sporadically fire rockets and mortar bombs at Israel.” In the same report Israeli actions were described as follows: “An Israeli naval patrol killed at least four Palestinians…on their way to carry out a terror attack.” This narrative presents Israeli aggression, the killing of unarmed persons in foreign waters, as a necessary response to Palestinian terrorism. In effect, it serves to ligitimise that aggression. “Journalists now use the words that are provided for them by power. For example, journalists use the term ‘spike’ in violence and there’s a reason for that, Americans like to see the word, because a ‘spike’ goes up and then a ‘spike’ goes down. If you were to refer to an ‘increase’ in violence, there’s no guarantee that it will go down. In the same way a ‘surge’ suggests a tsunami, or a massive natural force. In real terms this ‘surge’ is a reinforcement and you need reinforcements when you are losing a war. Similarly a ‘wall’ becomes a ‘fence’, a ‘settlement’ becomes a ‘colony’, which becomes a ‘neighbourhood’ or an ‘outpost’. On the 31st May an event occurred in international waters off the coast of the Palestinian territory of Gaza which has highlighted the pervasive influence of the “language of power.” A flotilla of vessels, manned by hundreds of activists and carrying tonnes of humanitarian aid, was intercepted and boarded by the Israeli navy. On the Turkish ship the Mavi Marmara nine activists were killed, most of them shot repeatedly at close range. Scores of others were injured, including several Israeli soldiers. The media news storm that followed the event can be defined by three characteristics: 1) The Israeli government version of events dominated coverage 2) Where the testimony of activists was reported it was generally in the context of denying Israeli allegations 3) Israel was presented as acting in self defence, whether as a state enforcing a blockade, or as individual soldiers protecting themselves; those aboard the flotilla were for the most part presented as instigators of the violence. The reason there was a media storm at all, unlike the killing of the Palestinians described above, is that this incident involved the kind of “bloodshed that would spark an international outcry” or to put it bluntly, Israel had killed non-Arabs. At approximately 4:30 am on the 31st May the communications systems aboard the vessels were blocked by the Israeli Navy, cutting off all contact with the outside world. Israeli commandos then stormed the ships in an operation conducted by hundreds of soldiers using an array of combat craft, including “four Frigates, three Helicopters, two Submarines and twenty Zodiac boats.” Once the crew and passengers had been subdued, the vessels were commandeered and “escorted” by force to the Israeli port of Ashdod. Here activists were stripped of all cameras, computers, telephones and recording equipment and “detained” against their will, only to be “deported” several days later on the condition they sign forms declaring they had entered Israel illegally. In contrast to the capture of British soldiers by the Iranian military in 2007 few commentators dared to submit that the activists had effectively been “kidnapped.” Where the term was used it was primarily in response to comments made by government officials, in this case Ireland’s Minister for Foreign Affairs. The events that took place during the attack on the Mavi Marmara are still disputed and will likely remain unclear in the absence of an independent investigation. This uncertainty has prompted some journalists to euphemistically describe them as “clashes“, suggesting a shared premeditation and thus an equal apportioning of blame. Details of the casualties aboard the ship do not however support this – injuries were ‘disproportionately’ sustained by passengers. Autopsy results revealed “nine Turkish men…were shot a total of 30 times and five were killed by gunshot wounds to the head. The results revealed that a 60-year-old man, Ibrahim Bilgen, was shot four times in the temple, chest, hip and back. A 19-year-old, named as Fulkan Dogan, who also has US citizenship, was shot five times from less that 45cm, in the face, in the back of the head, twice in the leg and once in the back. Two other men were shot four times, and five of the victims were shot either in the back of the head or in the back.” While the Israeli government claims one soldier sustained gunshot wounds, the navy recorded no fatalities. 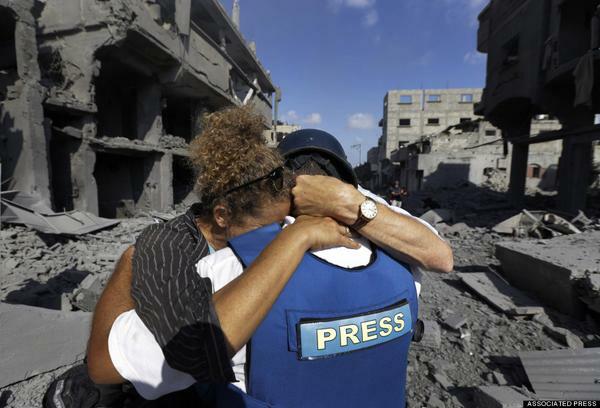 In the hours and days following the assault Israeli spokespersons dominated the media narrative. Access to the passengers was restricted, preventing any alternative narrative from emerging. The IDF and the Israeli Government’s Ministry of Foreign Affairs drip fed statements and selectively edited video and audio footage (less than 4 minutes of video footage has been released). This policy of providing video footage has had the effect of devaluing the authority of eye witness testimony, whilst also satisfying the media appetite for immediate, easily digested information, preferably with an authoritative stamp. At the same time footage taken by passengers remained under Israeli lock and key, with only those recordings concealed and eventually smuggled out made public. In contrast to the IDF videos this footage has not been publicised prominently. Eyewitness accounts which appeared four days after the assault told an entirely different story: “Patel claimed that as soon as the Israeli Defence Force helicopter appeared above the Mavi Marmara, “it started using immediately live ammunition” without any warning being issued. Harrison, 32, from Islington, north London, also witnessed the Mavi Marmara being stormed from above by helicopter and said the Israelis started firing before their troops touched down on the boat.” Yet articles suggesting the ships passengers had acted in self defence were in the minority. Much was made of the fact the passengers were “armed“, with reports describing passengers as “pipe and knife wielding pro-Palestinian activists,” a “knife-wielding mob” and “protesters wielding knives and clubs.” The array of “weapons” including “knives, metal rods, chains, broken bottles” can no doubt be found aboard any boat, but was still considered of major importance. Other more extravagant accounts stated “two pistols had been found on the Turkish ship” and that the navy “were shot at.” Later reports explained that “activists had fired guns they had seized” from the armed soldiers. Activists were therefore continually forced to deny in the first instance that they were armed and then to prove their peaceful intentions. The guns, we were eventually told, had indeed been taken from the soldiers, they were then thrown overboard or ‘made safe’. And with that we come full circle. Despite recent talks over the “easing” of the blockade, the nine dead peace activists have become not a symbol of Israel’s aggression, but a reminder of the threat it faces. This seemingly irrational conclusion could be considered a natural consequence of the compromises journalists make in their choice of langauge. From “escorted” to “detained” and “deported”, from “blockade” to “dual-use equipment”, from “militant” to “extremist” and from “security” to “self defence” journalists have relinquished control of language and in the process they have allowed the news to be framed by power. If Fisk is right, it’s time we looked elsewhere for our news. * Correction – Gideon Levy is a former deputy editor of Haaretz. He currently works as a columnist and a member of the newspaper’s editorial board. The arrival of Matthew Elderfield a.k.a. The Financial Regulator a.k.a. The Regulator a.k.a. The Sheriff of Dodge City has been universally heralded by the media and political establishment as the second coming of Christ. Well, the Christ of ledgers, calculators and informal speeches at the Financial Services Ireland Conference anyway. At a time when public sector workers and government are almost uniformly pilloried in the press, this hyperbolic enthusiasm for a single high profile public servant appears all the more unusual. The use of the metaphor is pervasive. While some journalists don’t directly refer to him as the sheriff, they apply common idioms that resonate similarly. We are told Elderfield “sticks to his guns” and “takes-no-prisoners.” The enemies he has been tasked with “eliminating our beloved banking bad boys,” the country’s formerly “untouchable” financial gangsters. Unlike “his hapless predecessor” he has no interest in winning friends: “No doubt he will not now be wined and dined by the Irish Bankers Federation.” Displaying only his keenness to break-up the “cosy relationship” previously enjoyed between regulators and bankers. The man himself is described in much the same way successful businessmen like Michael O’Leary and Sean Quinn are portrayed in the kind of articles found in Sunday newspapers – the ones which pay tribute to their tumultuous careers. Quinn for instance is portrayed as a “man from humble beginnings who has created a multi-billion-euro empire,” “a doughty opponent of establishment monopolies.” In 2007 Quinn invested €570 million in Anglo Irish Bank, the “anti-establishment” bank. Quinn, we are told, made “business buzz” (The Quinn family currently “owe Anglo Irish Bank €2.8 billion”). Highlighting this fanfare is not intended to undermine the importance of financial regulation, after all there is little point having laws if there is no responsible person around to enforce them. It is simply an attempt to understand why the media can be so easily worked into a fever about certain things and, in this case, certain people. One of the principle aims of regulation, aside from oversight, enforcement and prosecution, is to maintain confidence in the financial system. What better way for a government to overturn a crisis of legitimacy, in itself and the financial system that bolsters it’s power, than by restoring public confidence in that system? With that in mind, the idolisation of “Sheriff Elderfield” begins to make sense. The appointment and support of Elderfield, does much more than “show the world that the wild west of European finance has been tamed and is now a safe place to invest and do business,” it effectively provides a new facade behind which the business of politics can go on unchanged. The only wing of the establishment to make official grumblings on the occasion of his appointment was the financial sector, who are, understandably, concerned about the implications of someone potentially applying the rule of law as it is written. More recently ruminations from government have surfaced, albeit from rather more forthright party members. Fianna Fáil TD for Cork East Ned O’Keeffe addressed the Dáil in the last weeks saying: “There is nothing worse than overregulation. It brings further mischief, contempt and blackguardism because people will find their way around it. We have seen that occurring.” A blunt reminder of the “tacit discouragement” of regulatory “determination and tenacity” by senior politicians in the preceding decade. Journalist and broadcaster Matt Cooper responded to this inversion, seemingly without irony: “He seems to think so little of those who run Irish banks, and by extension the Irish mentality, that he believes they would concentrate on beating, bending or breaking the rules rather than doing the right things.” A strange statement from a journalist who has not been shy to voice condemnation of Irish banking, referring to “arrogance“, “recklessness” and “criminality” as their principle economic contributions. This “deregulation mania” was obviously not an American phenomenon. As Krugman writes, “the most striking similarity between Ireland and America was “regulatory imprudence”” driven by ideology. An ideology that led the formerly popular figure Sean Fitzpatrick to pronounce, “There are those who appear to want to establish Ireland as the perfect model in corporate policing and regulation . . . But why? What has been done here over the past decade that demands such a reaction?” at none other than the Irish Times Property Advertising Awards 2005. We are again beginning to see hints of this again – the regulator’s move to put Quinn Insurance into administration was followed by large scale public and private lobbying of government ministers, the mobilisation of thousands of workers to protest and what amounted to a coordinated PR barrage against the regulator in the press. The obvious question arises: If the country was not embroiled in the current economic predicament and if public awareness did not extend to the complexities of insurance solvency ratios would these protests have been met differently by both press and government? Enda Kenny the leader of the opposition has also recently cautioned “against an over-regulation of the property sector,” in response comments made NAMA’s chief executive Brendan McDonagh, who told an Oireachtas committee the agency would go after developers “tooth and nail” for debts. It’s quite clear then, no matter whether your Financial Regulator chews tobacco, looks good in a Stetson or walks on water, as appointed representatives they remain susceptible to the influence of higher powers. Not until the structure of our economic and political institutions and the ideological orthodoxy that underpins them are challenged will we ensure history does not repeat itself. The media for their part have shown an unwillingness or inability in this regard. Favouring the Rich – A Media Prerogative? The media response to last week’s ‘cowardly‘ ‘budget from Hell‘ has been suitably contradictory and best summed up by the Sunday Independent Editorial writer who described it as ‘courageous masochism‘. While commentators are for the most part agreed that the budget, which focused almost entirely on cutting public sector spending, specifically spending on social welfare and public servant pay, was ‘tough medicine‘, the overriding sentiment is one of satisfaction. A convergence of opinion Garret FitzGerald was surprisingly oblivious to. Writing in the Irish Times the former Fine Gael Taoiseach protested, “no one is actively celebrating the achievement of a further €4 billion fiscal adjustment.” The reader taking for granted he had accidentally omitted the word ‘fantastic’. Yet an Irish Times/Behaviour Attitudes poll published less than two weeks before the budget found that “more than two-thirds of those surveyed were opposed to welfare cuts, while some 56 per cent said they oppose [public sector] pay cuts.” Clearly then, a general agreement had been made without the consent of the Irish public, a general agreement of the ruling class perhaps. During a post budget exchange between Vincent Browne and Fintan O’Toole on Tonight with Vincent Browne, O’Toole described what he saw as a complete failure in responsibility on the part of the media, saying that the media bought into an analysis which says ‘there is no alternative’ (a favoured slogan of former British Conservative Prime Minister Margaret Thatcher). He gave the example of a recent ESRI report on subsidies for Irish pensions, which indicated that the introduction of pension relief at a standard rate could bring in a billion Euros, yet there was not a single piece of discussion of this in the Irish media. Yet in the 10 days leading up to the Dail vote on the legislation, the media build-up was what you might call mute. Of the dozen or so opinion and analysis articles published between the Irish Examiner, the Irish Independent and the Irish Times, the strongest worded criticism was, “the banks’ fetid loan books” have the “potential to wreck us all.” Somewhat predictably this criticism came only in the context that the public finances have just as much ‘potential’. Yates’ position typifies the general media consensus on the economic crisis. While it is widely recognised that a rich elite caused the downturn, the general public should ultimately pay for the recovery. So where the banking bailout is concerned, there are no calls for ‘leadership in the national interest’, no calls for a ‘war on corrupt financial institutions’, no calls for the slashing the pay of all the ‘greedy, incompetent bankers’ and most importantly no calls ‘to resist pressure from vested interests’. The furore over Mahmoud Ahmajinedad’s apparent success in last months Iranian presidential elections tells us a few important things about how the dominant media feels democratic deficiencies, alleged or otherwise, should be reported. According to the Irish Times Iran’s “suffocating theocracy”1 sustained a crisis of legitimacy “after it lost the trust of millions of Iranians”2 following the “stolen elections”3 of 12th June. Opinion pieces recounted personal stories of the plight of dissenters within the “democratic rebellion”9: one “highly regarded social scientist” stood “baselessly accused of working with a US research organisation to foment a “velvet revolution” to overthrow the Iranian government,”10 while another was gunned down “collapsing like a young faun shot by poachers”11 as she watched street protests. Clearly the possibility of election fraud is considered a very serious matter, offering, according to the Irish Times, a “case study in the argument between interventionists and those who say political change must be allowed to develop autonomously within authoritarian regimes.”12 Important enough then to potentially justify compromising a country’s sovereignty. Last month “amid the rattle of gunfire”13 a military coup overthrew the democratically-elected government of Honduras. The President, Manuel Zelaya, was kidnapped and exiled to Costa Rica. He currently resides across the border from Honduras in Nicaragua, where he is attempting to negotiate the terms of his return. The military response to ongoing protests that followed the coup has resulted in a number of confirmed deaths, with scores injured, 45 in just one single day.14 The OAS, the EU, the UN and numerous world leaders have publicly condemned the coup and sought to put pressure on the coup leaders to relinquish their grip on power and allow the elected president to return. All this has been reported by the Irish media, in so far as copying and pasting wire stories constitutes reporting. Surprisingly though, the passion and arguably unfounded certainty of the reporting on Iran is no where in evidence this time round. The Irish Examiner went to great lengths to manufacture some semblance of balance in order to justify the existence of an “interim government” as opposed a military backed regime. Describing a “showdown” between sides – the Examiner pitted Mr Zelaya’s supporters, “mostly the country’s poor and middle class” against “the largely well-to-do backers of the coup that ousted him.”23 A more lopsided balancing act would be hard to come by. On 6th July an attempted return by President Zelaya was scuppered when his plane was refused permission to land. Protesters who had gathered to welcome the exiled president were instead greeted at the main airport in the capital Tegucigalpa by military gunfire, leaving two dead. Yet, unlike the Iranian “young faun shot by poachers” media reports chose to focus on the excuses for killing unarmed protesters. They were “trying to break down a perimeter fence” and attempting to “storm the runway”25 explained the Irish Independent, devoting only a single sentence to the murdered protesters. RTE, similarly, described how troops “fended off”26 thousands of Mr Zelaya’s supporters. Even the basic facts of the coup were to be disputed. Not until half way through the first Irish Times report on the coup does the reader hear the perspective of the elected leader, even then, his account is somehow put in doubt: “The president told Venezuela-based Telesur television station that he was “kidnapped”27 by soldiers.” The word “kidnapped” placed in quotation marks, as if a president led by soldiers to plane in his pyjamas and transported out of his own country against his will did not reasonably constitute kidnapping. The next day the Irish Times expanded on the wire story, filling in some gaps, and inadvertently evoking images of an unappreciative Late Late Show holiday winner: “troops came for Mr Zelaya, an ally of socialist Venezuelan president Hugo Chavez, around dawn and took him from his residence.” He was then “whisked away”28 to Costa Rica. Even the choice of complementary facts accompanying reports appears to lend misplaced credibility to the ousters, for instance one report ended with the loaded factoid: “Recent opinion polls indicate public support for Mr Zelaya has fallen as low as 30 per cent.”29 Marking perhaps the first time opinion polls have been used to justify armed takeover of government. A fact that must have sent shivers up Brian Cowen’s spine. Clearly then, if the ‘paper of record’ deems that a proposed constitutional amendment paired with low opinion ratings spells military coup, Brian Cowen should really be packing for a few weeks in the sun. In Part 1 of this MediaShot we discussed how the media can often skew debate in their search for a balancing argument or ‘the other side of the story’, specifically in the case of climate change. Ken O’Shea, RTE Editor of Current Affairs defended RTE’s decision to challenge the scientific consensus on the basis that ‘dissenting voices…feed and inform the debate’, allowing ‘people to make up their own minds’. While there is some truth to this, presenting a ‘daring challenge to the consensus’ on a respected current affairs programme has the potential to undermine current pressure to tackle climate change and justify inaction. Thanks for taking the time to respond, it’s much appreciated. At no point was the documentary ‘Not Evil Just Wrong’ described as controversial, in fact the introduction to the programme claimed the documentary makers had ‘dared’ to challenge ‘these kind of scares’, framing them as courageous mavericks tackling a ‘scare’*. Assuming though that the intention was to paint Mr. McAleer’s stance as controversial, the expectation of an informed debate on global warming was not forthcoming, at least on one side. Mr. McAleer was actually unwilling to discuss global warming at all. When asked by Dr. Hickey to focus on the issue Mr. McAleer replied “Let’s not talk about climate change” and this was his position throughout the programme, where he discussed everything from BSE and DDT to former US Vice President Al Gore. When he did refer to climate change he did so only in dismissive terms, such as ‘global warming hysteria’ and ‘flawed science’. At no point did he challenge the science. And since the documentary has not been released, viewers are none the wiser as to whether there’s any actual evidence in the documentary. The underlying purpose of Mr. McAleer’s appearance was to demonise and ridicule ‘anti-development’ and ‘anti-capitalist’ environmentalists, who see ‘poverty as a lifestyle choice’ – a platform he has been offered by RTE on several occasions, when he has a film to promote. On the eve of the release of his last documentary ‘Mine Your Own Business’ RTE spliced clips of his film with footage of the Corrib protests. So it would seem that to some extent at least RTE and Mr. McAleer have similar positions. My complaint is not that there shouldn’t be debate over the science of global warming if there is a serious debate to be had, and which I don’t believe there currently is, but that there is little value in the spectacle of a scientist forced to defend the environmental movement against charges of wanting to keep the poor poor – other than to cause confusion and sow doubt over the issue. The implementation of ‘balance’ in this instance, required that climate ‘sceptics’ be consulted on issues they have demonstrated no authority on, and even when they are quite obviously compromised by financial links to the carbon industry. I appreciate the fact you brought George Monbiot over by ferry, but to watch this programme on RTE.ie viewers have to watch an advertisement for the Opel Insignia, repeatedly, depending on the quality of your connection, so perhaps there’s somewhat of a contradiction in RTE’s environmental policy. I don’t agree with all your points there David (and I’m not responsible for the ads on the website) but I’ll take your views on board. Remember though, Prime Time is a forum for topical debate and different ideas. I think any reasonable person watching that item would be well able to make their own mind out about the merits of the arguments being put forward. And we will always retain the option of bringing the odd contrarian on, to keep things interesting. While this may not answer all our questions we greatly appreciate RTE’s honest attempt to engage with viewers. Institutions such as the Irish Times and the Irish Independent have no such relationship with their readers. While they often print critical letters in the back pages, they are entirely unwilling to have their own reporting held to account. This Prime Time debate obviously had little to do with climate change. It did however allow thinly disguised space for another debate. This debate centres on the intentions and motivations of the ‘environmental movement’. As in 2006, when RTE invited Mr. McAleer to promote his documentary supporting the exploitation of mining resources in northern Romania (and funded by the mining company positioned to exploit those resources) the agenda was one of demonising environmentalists. Mr. McAleer’s claim that he is a ‘reformed’ environmentalist makes his scepticism all the more intriguing for a media obsessed with ‘balance’. And so it is exactly the case with Phelim McAleer. He is now consulted as an authority precisely because he has turned his back on a position unpopular with industry, to one where industry finances his projects. This corrective leap towards the considerations of power is deemed by the mainstream media as a virtue – though it’s “hard to figure why an acknowledgment of former errors should enhance one’s current credibility.” Apostates are nonetheless highly regarded when they revert from positions unpopular with the mainstream to ones that defend the status quo. In October 2006 RTE Prime Time presenter Miriam O’Callahan asked this question of Dr. Mark Garavan, the Shell to Sea campaign spokesperson, referring to their six year protest against Shell’s planned construction of an onshore high pressure gas pipeline in the north west of Ireland. In November 2006 a Prime Time segment titled ‘Environmentalism in Irish Life’ reported on Phelim McAleer’s recently released documentary ‘Mine Your Own Business’ (the film was also reviewed by the Irish Times and very favourably so by the Irish independent). In the following studio discussion Phelim McAleer referred to the ‘new religion of environmentalism’ and to co-panellist and current Minister for Communications, Energy & Natural Resources Eamon Ryan (at the time an objector to Shell’s gas project) as its new ‘high priest’. He said environmentalists are ‘anti-progress’, ‘anti-jobs’, they would ‘ban the car’ and ‘they are killing children by opposing development’. Fundamentally he charged: ‘they don’t want humanity to advance’. Presenter Mark Little attempted to make the argument locally relevant, suggesting that the Corrib gas campaigners ignore the “energy needs of the country,” thereby reinforcing the frame that environmentalists are not concerned about the needs of people. It is hard to imagine an RTE presenter commenting to a representative of the oil industry: “There is a perception that Big Oil cares more about crude than children and the lives of children”, even though it would be much closer to the truth. Whether it is climate change, nuclear proliferation or the case for war, the fundamental flaw in the implementation of ‘balance’ is that where the consensus fails to support the dominant power structure, the mainstream media often search for some mitigating argument or point of view, however unconvincing. So accusations of nuclear proliferation are resurrected to balance statements of compliance by international authorities, allegations of clandestine warfare are echoed uncritically to balance military reports that weapons are not linked to enemy states and industry funded experts are consulted to balance evidence that urgent action is needed to stop the earth dangerously warming. Miriam O’Callaghan concluding a recent Prime Time segment ‘Questions raised over global warming’, making the surprising claim that there exists a ‘debate’ over the science of climate change. All the more surprising given the preceding segment raised no questions about the validity of the science. It offered no new discoveries and only half heartedly revisited old criticisms. Prime Time, RTE and their broadsheet counterparts consider themselves opinion leaders and shapers. They present themselves as conduits for informed analysis and claim to ask the ‘hard questions’, sometimes making for ‘tie-loosening telly’. In this edition of Prime Time, RTE sought to satisfy ‘one of the traditional pillars of good journalism’, the need for a ‘balancing’ argument – to counteract a possible perception of bias towards coverage of climate change science. In doing so RTE have sought out ‘sceptics’, unqualified in the field and who have been in the pay of an industry whose survival depends on undermining the scientific consensus, to ‘balance’ the ‘debate’. Global warming sceptics are most likely not professionals in the field of climate science. They are however suitably adept in the art of polemics. And debates lend themselves to polemics far more readily than they do to facts, making the climate expert’s task far more difficult than the sceptics. From this exchange it may appear to the uninitiated, and no doubt even the initiated, that Dr. Hickey was forced to concede the point to Mr. McAleer. That the sceptic had caught the climate expert out; perhaps there are some holes in the science. But this is obviously not the case, as we’ll see in a moment. The difficulty is that science, and most scientists for that matter, are not ‘designed’ to convey complex information in sound bites – the commodity of mainstream media discourse. This forced and unnatural succinctness is designed to maintain audience interest, as presenter Miriam O’Callaghan made abundantly clear: [to Dr. Hickey] “Don’t get too technical or I’ll lose my audience.” This imbalance of discourse lends itself to the ‘sceptic’, who need only question a certain complex part of the thesis in the knowledge that the expert will have insufficient time or audience attention to refute the claim. As you can see from the graph the global average temperature measured on a decadal interval between 1998 and 2008, indicated by the highest blue line, shows a temperature increase of only 0.09°C. However, as Dr. Hickey says, you cannot compare the decadal figure with the yearly figure. Depending on the interval you choose to measure, be it 10 year, 8 year or 2 year the trend may change. If you were to take a 2 year interval you may find global temperatures decreasing in some of the two year periods, but it would be impossible to say on the basis of this that the underlying trend has not been upwards. This trend, indicated by the red line, shows that the climate has been warming consistently since the 1980’s. Unfortunately for the scientist, he is bound by certain terms of reference and modes of discourse that the polemicist or sceptic is not. Dr. Hickey is compelled to concede that the decadal figure does not reflect the magnitude of warming in the underlying trend. The segment titled ‘Questions raised over global warming’ on the Tuesday 25th November edition of Prime Time, including excerpts from the as yet unreleased documentary ‘Not Evil Just Wrong’ and discussion between Dr Kieran Hickey and Phelim McAleer, was designed to lead viewers to believe there is an ongoing ‘debate’ over the validity of the science underpinning the theory of Global Warming. The programme was misleading in that, despite what the title of the segment suggested, the former corporate documentary maker Phelim McAleer [Mine Your Own Business, Phelim McAleer’s last documentary was funded by Canadian mining company, Gabriel Resources] did not raise any valid questions over the science of global warming. He simply reverted to a fundamentally flawed and reductionist line of reasoning which alleges that since the proposed solution to global warming is a decrease in carbon emissions, moves by environmentalists to encourage that necessity evidenced an anti-development, anti-capitalist motivation and in his view demonstrated a preference for animals over humans. When all the experts agree that urgent, costly and potentially unpopular action is required to combat global warming how can RTE justify presenting discredited opinions as informed debate? Thank you for your email re: Tuesday night’s programme. I’m sorry you disagreed with our choice of story on the night in relation to climate change. However, I disagree with some of the points you raise. First of all, it was made abundantly clear in the studio introduction to the piece that we were intentionally going to hear the other, “controversial”, side of the climate change debate. We made it very, very clear that the vast majority of international scientific opinion believes that climate chance/global warming is a deeply serious reality. But we also said that there are some people who believe the gravity of the situation may have been overstated. Although you may not agree with that, there are a substantial number of scientific and non-scientific individuals who do not agree with the current consensus on climate change. We said we were going to show excerpts from a controversial – and we stressed that – documentary which challenged the consensus. Throughout the excerpt, we ran a caption which made it clear that it was not a Prime Time report, but a cut-down of somebody else’s documentary. And after that, we had a debate with an internationally known Irish scientist who vigorously and coherently challenged all aspects of the filmmakers thesis. Regular viewers will know that we have extensively covered the climate change issue in recent years, investing considerable resources both and home and abroad in telling what we know to be a vital, urgent and serious issue. We have had many scientific experts – national and international – on our show talking about the gravity of the situation. For instance, a few months back we paid for a ferry (!) ticket for George Monbiot to come over from London to talk about his work. But one of the major functions of any current affairs operation is to examine all sides of an argument and I think we should always have a little room for dissenting voices on every issue. That feeds and informs the debate. And, crucially, it allows people to make up their own minds, once they are presented with both sides of the argument. Thanks for taking the time to write to us, audience feedback is critical to what we do. To read Part 2 of this MediaShot follow this link.